Ken Research announced its latest publication on "Global Robotic Surgery Market by Region (North America, Europe, Asia Pacific and ROW), by Product Type (Surgical Robot System, Instruments and Accessories and Services) - Outlook to 2022" provides a comprehensive analysis of the robotic surgery market globally. The report focuses on the major surgical robots of the industry. The report covers aspects such as robotic surgery market by its key segments including market size by regions, product type, application and brands. It also covers the robotic surgery market by its product categories including surgical robot system, instruments and consumables and services. The publication also includes competitive landscape and current and anticipated market share of major brands and companies. The reports also provides in depth case studies for cost comparison of robotic surgery and laparoscopic procedures, merger and acquisitions in the market. Furthermore, the report includes snapshot on the robotic surgery market of the US and Europe. 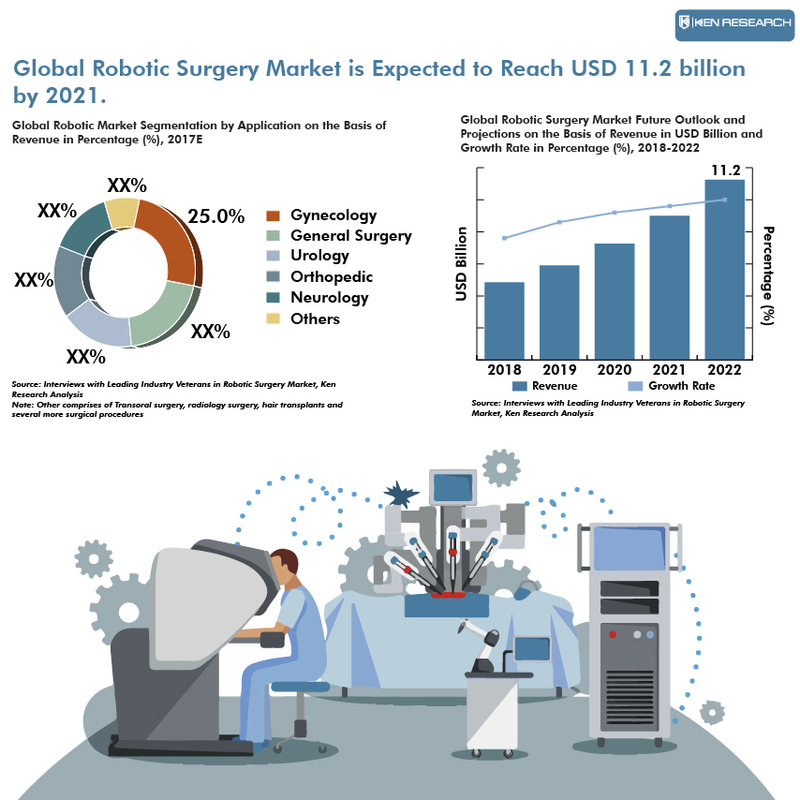 The future analysis of overall Global Robotic Surgery Market and by regions with estimated demand projections has also been discussed along with analyst recommendations. Rise in need for faster recovery, reduced pain and discomfort has led to growth of global robotic surgery market in the past few years. Owing to rising adoption of minimally invasive surgeries, the market for global robotic surgery grew at a healthy pace during 2011-2016. During the concerned period, market grew predominantly due to increase in sales of da Vinci systems across the world and surgical procedures performed by them. The number of installed da Vinci systems grew from ~ in 2012 to ~ in 2017 and the number of surgical procedures conducted inclined from ~ in 2012 to ~ in 2017. The market growth was also aided due to the commercial launch of several new systems in the US and/or Europe and other territories. By Regions: North America accounted for the highest market share in 2016, in terms of revenue. This was primarily due to high standards of healthcare infrastructure, high patient awareness levels and high healthcare expenditure by consumer and government as compared to other regions of the world. Over ~% of the North American revenue was due to high adoption of robotic surgery systems in the US. Of the ~ da Vinci systems installed worldwide, ~ of them were installed in the US alone. North American market was followed by Europe, Asia-Pacific and Rest of the World (ROW). By Product Type: Instruments and accessories such as sterile drapes, light guides, and camera heads facilitate the use of robotic systems and are required to be replaced after every procedure. As a result, instruments and accessories was the largest revenue generating segment in 2016 owing to the rising volume of robot-assisted surgeries worldwide. Incline in the number of surgical robots installed in hospitals coupled with high cost of robotic surgery systems resulted in robotic systems to account for a significant market share in 2017, in terms of revenue. All surgical robots required regular maintenance such that they perform surgeries with extreme precision. However, services generated the least revenue in the overall global robotic surgery market in 2017. By Application: Gynecology was the largest segment wherein robotic systems were used widely for surgeries as compared to other fields of application. Gynecology comprised for ~% market share in the overall global market for robotic surgeries in the year 2017. Approximately, ~ gynecology robotic surgeries were performed in the US alone in 2016 and over ~ are expected to be performed by the end of 2017. The high utilization in gynecology was due to the effectiveness of surgical robots over classical methods, faster recovery, lesser blood loss and proven track record in the past. Use of surgical robots in Gynecology was followed by General Surgery (~%), Urology (~%), Orthopedic (~%), Neurology (~%) and all other surgical procedures (Transoral surgery, radiology surgery, hair transplants and many more). The global market for robotic surgery is very concentrated and highly competitive, owing to the fact that the leading player has a clear dominance and first mover advantage over others. Technological advancements and new product launches will increase the level of competition in the already competitive market. The fact that all companies developing surgical robots also provide accessories and consumables required for every surgical procedure, and also provides round the clock service / maintenance support will further intensify the market’s competitive environment. Intuitive Surgical has been marketing its system since 2000’s and as a result clearly dominated the market for robotic systems by comprising for about market share of ~% in 2017. Some other leading companies in this space including Accuray, Stryker, Mazor Robotics, Smith and Nephew and Zimmer Biomet comprised for market share of ~%, ~%, ~%, ~%, and ~%, respectively in 2017. The key factors driving the growth of the robotic surgery market are rise incidence of chronic disease, growth in minimally invasive surgery (MIS), and incline in number of surgical robots getting clearance from regulatory authorities. The market is also expected to grow due to technological innovations such as the capsule robot system, software/applications and imaging system, increasing geriatric population base and increasing per capita healthcare expenditures. During the forecast period, at least ~ surgical robots are expected to be commercially launched in the US and/or European markets. Around ~ of them are expected to be launched as direct competitors to da Vinci system for specific soft tissue surgeries. Overall, the market for robotic surgery is expected to grow at a CAGR of ~% during the period 2017-2022.